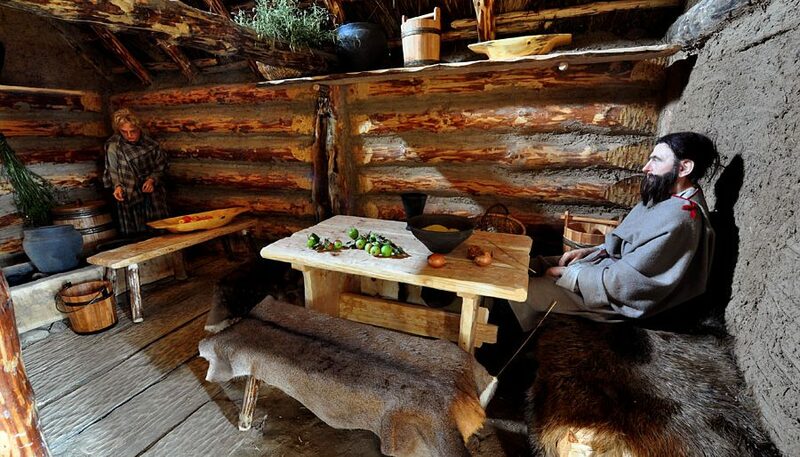 The Blacksmith Hut is a faithful reconstruction of a house from the Roman influence era. In Faktoria you can get to know this character, watching the reconstruction of his house and the forge containing tools for processing iron. All the items of material, wood and wicker were made in the traditional techniques. Before entering the hut you can see the blacksmith’s workshop: a furnace with bellows and wooden barrels with water, used for hardening manufactured items. On a wooden tree stump there are basic tools of there the manufacturer: anvils, tongs, hammers, files, perforating punches, and others. It is worth noticing that – generally – ancient tools used by blacksmiths have survived in its original form untill day. The Hut itself was made of oak wood and conifers. The substrate is wooden, made of planks of logs. In the hut there are typical household utilities: in the corner you can see a rectangular fireplace, a bed covered with fur and hand-woven, woolen textiles, table and seats, a trunk, performing the functions of the bench for sitting and locker for items as well.